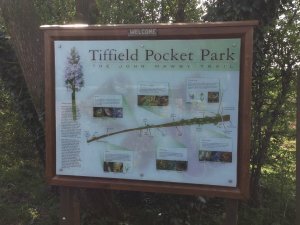 Tiffield Pocket Park was awarded Local Nature Reserve status in 2008. Tiffield Pocket Park is a linear park occupying a section of what was formerly the railway line to Towcester. It was in the 1980s that a group of local residents first considered using the old track for this purpose. The track was very overgrown, and it took a number of years before the pocket park was in a useable state. On many a Sunday morning, a collection of volunteer residents could be seen wielding saws, rakes, axes, and other instruments of destruction in order to clear the undergrowth and make the area fit for purpose. The Pocket Park was set up as an independent organisation, the two "leading lights" being Martyn Greenaway-Rowe and Brian Taylor, both former residents of Meadow Rise who have now left the village. A pond was created, with a "dipping platform" which is used by the village school children. Various areas of the Pocket Park are named after those original hardworking pocketeers – Gordon's Glade (Gordon Bradley), Miller's Meadow (Keith Miller), and, indeed, Paula's Tree (Paula Chaplin), which is a distorted tree on which the company sat to drink their tea! The Pocket Park has been awarded Local Nature Reserve status, and links to other public footpaths in the area via steps at Gayton Wilds. 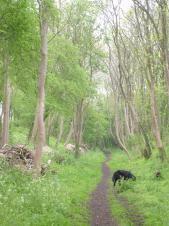 It is used not only by residents of Tiffield and Gayton for walking dogs, but is visited by walkers from far and wide. Where Does It Get Its Income From? The Pocket Park was formerly an independant organisation. Although now managed by Tiffield Parish Council, and the Parish Council also pays the annual rent for the land, it is intended that the Pocket Park should otherwise be self-financing. There are a number of residents and friends who make monthly donations by standing order. Villagers are encouraged to support the Pocket Park in this way, and if you would like to do so please contact Paula Chaplin on 01327 352002. In addition, a "bucket collection" is made at the annual fireworks display, and there is also a collecting box on the bar at The George into which customers often put their loose change. Fundraising activities are also organised from time to time. What Does It Do With The Income? There is a considerable amount of maintenance work undertaken to keep the Pocket Park looking beautiful and to ensure that it retains its Local Nature Reserve status. Much of this is undertaken by volunteers, and from time to time a "working party" of volunteers is required to undertake some of the work - you will be able to see details of this on the village noticeboard and on the Tiffield Villagers facebook page. In addition to the work undertaken by volunteers, materials are required for the maintenance of gates and fences, and from time to time specialist contractors need to be called in to undertake specific maintenance projects.